And let my eyes be protected by he who fulfills wishes. Ithi Sri brahmyamaloktham Sri Brahaspathi kavacham sampoornam. Thus ends the armour of Jupiter which occurs in Brahma loka. Jupiter is watery in constitution (kapha), wears yellow clothes and yellow flowers; his gem is yellow sapphire. A Brahmin, Jupiter knows all the Vedas and is expert in all forms of knowledge. As guru, Jupiter has the highest forms of knowledge, philosophy and spirituality (para vidya) and teaches the sacred paths. Jupiter is Lord of the body’s fat, of the northeast, rules Thursdays, and the signs of Sagittarius and Pisces. 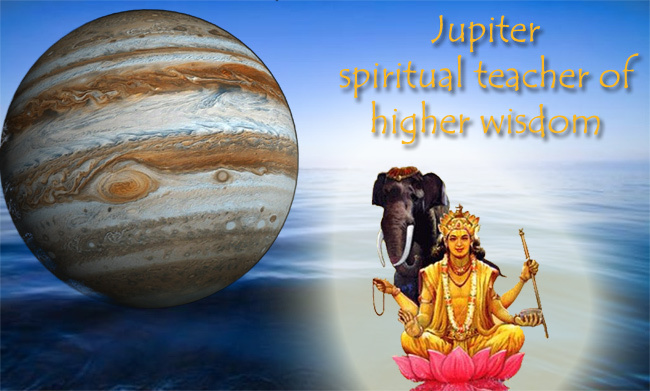 Jupiter is known as the Lord of Worship and as the Guru. He is called Teacher of the Immortals, the Soul, the Advisor, the Lord of Speech, the Golden, the Creator (he is but another form of Brahma) the Compassionate, the Creator of Polity, remover of oppression and the Peaceable. As Guru, one honours one’s own guru by honouring this planet, Jupiter. If Jupiter is exalted, a man or woman becomes scholarly, learned, specialist in languages, pious and noble. If Jupiter is malefic, a man or woman becomes a poor beggar, reduced to utter poverty. He grants knowledge of Yoga, Astrology, Vastu, science and mathematics, and is the giver of wisdom which overcomes obstacles. Jupiter as guru guides us in following dharma (the path of righteousness within and without) for dharma is the basis of the Universe itself. Jupiter indicates such domains of principle as law, religion and philosophy. He is the planet of intelligence. As Mercury shows our outer communications and career in life and interaction with culture and society in general, Jupiter shows our inner career wherein we find self-fulfilment, and what we enjoy doing. However, Jupiter does not pay as much attention to detail as Mercury does, so without a strong Mercury in our charts, we may not express our found wisdom with the gracefulness and profundity as we might wish. Effort may be needed in the area of communication; this does not mean we are bereft of intellect or wisdom. There are many different ways to get a message across. 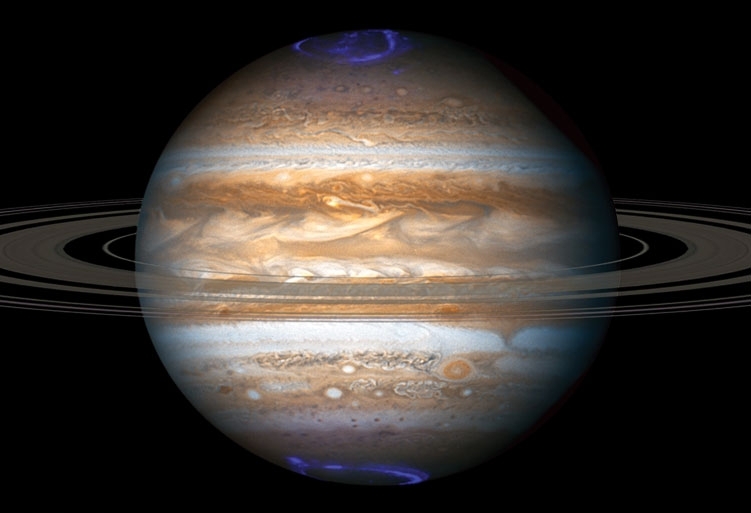 Jupiter’s energy is that of expansion; it expands everything it touches, making it bigger and greater. Some call Jupiter a multiplier, for this is what Jupiter does. If Jupiter is well placed in your horoscope its influence will be toward humanitarian activity, compassion, morality, caring, spirituality, optimism, faith and good judgement. One will be powerful, respected, healthy, wealthy, and a leader in society. Ambitious people who are aiming for high office whether it be politicians, priests, executives or judges are all under the influence of Jupiter. When Jupiter is afflicted in one’s astrological chart it will bring poverty, anger, arthritis, illness of the liver and pancreas, and overall bad luck. Jupiter is a great optimist who brings joy and comforts to life. Jupiter lives in a positive spirit, and all sorrows, misfortunes and suffering are turned into a learning experience under the guidance and wisdom of Jupiter. If we open our inner spiritual doorway, Jupiter is our natural environment who satisfies all our needs and bestows grace upon us without us seeking it. Therefore, Jupiter seeks that we boat down the middle of the river in order the reach the goals of life. We do not sail the waters of asceticism, nor do we sail waters of indulgence. A healthy sense of going down the middle path in live is what Jupiter offers – and gives. Self discipline is always born of self-understanding and self management, the two forms of higher knowledge (para vidya) that Jupiter bestows. Jupiter – when overly strong in a desire sign (kama, desire)(Gemini, Libra, Aquarius) in the astrology chart can push us to becoming materialistic, fond of wealth and caught up in conventional values and beliefs. Jupiter is a joyful planet, but the pursuit of the goals of life must always be balanced; wealth and desires (artha and kama) must always proceed with righteousness and union with Divinity, (dharma and moksha) hand in hand. They are like the four tyres on the motor vehicle; if too much weight is placed on the wheel the axle will break; or, if too much air is placed in the tyre, the tyre will burst and cause an unfortunate consequence (every action produces a reaction). So generous and joyous be the gifts of Jupiter, it behoves every man and woman to recall Jupiter’s teaching role and wisdom role: always proceed with balance. Astrology indicates predispositions for inner illumination, enjoyment of what one is doing and self-understanding. Jupiter is the guru and guide for our intellect, our intelligence, our understanding. As a planet of principles to be followed in our life, Jupiter bestows much wisdom upon us. He may value sweets, he may value comforts and luxuries in life, but never at the expense of seeking the four goals of life. This is the wisdom of Jupiter as Guru. To discover your inner wisdom, where in your life this may manifest, along with your religious and worshipful proclivities, seek an astrological reading with the Puttparthi Vedic Astrologer, Sai Bharathi. Seek one reading here and make payment thought Paypal.